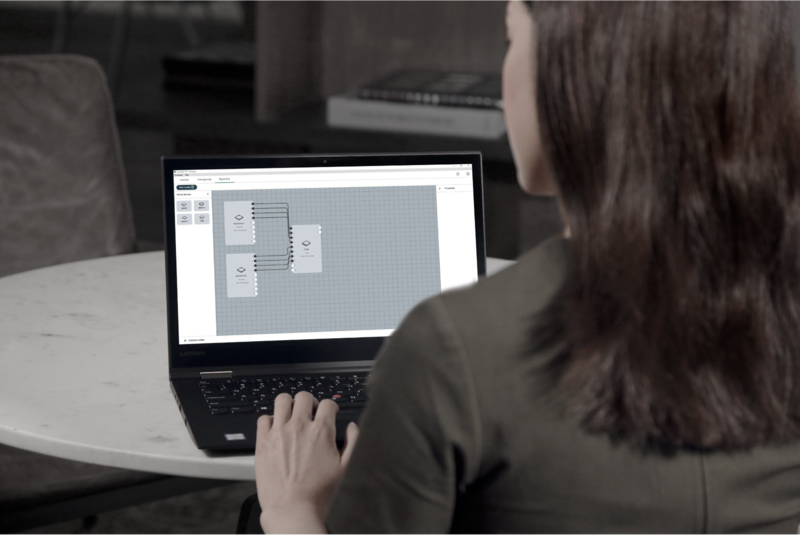 Designer System Configuration Software enables integrators and system planners to design and implement accurate audio coverage for installations using a variety of select Shure microphones. Designer allows online and offline design, routing, configuration, and push to live devices, all in one tool. 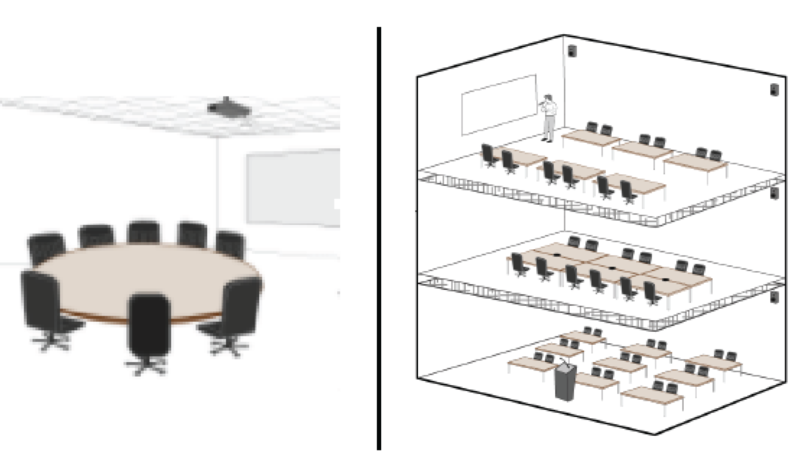 You can accurately model meeting and presentation spaces by importing a floor plan, scaling your room, positioning devices around participant areas, and arranging the pick-up lobes over the room diagram for precise coverage. After completing your design work offline, you can push the settings to the live devices and fine-tune on site, all from within Designer. If you prefer, you can always export the device presets to upload and use each device's web user interface. Start a Designer project and create a location that matches your planned environment. 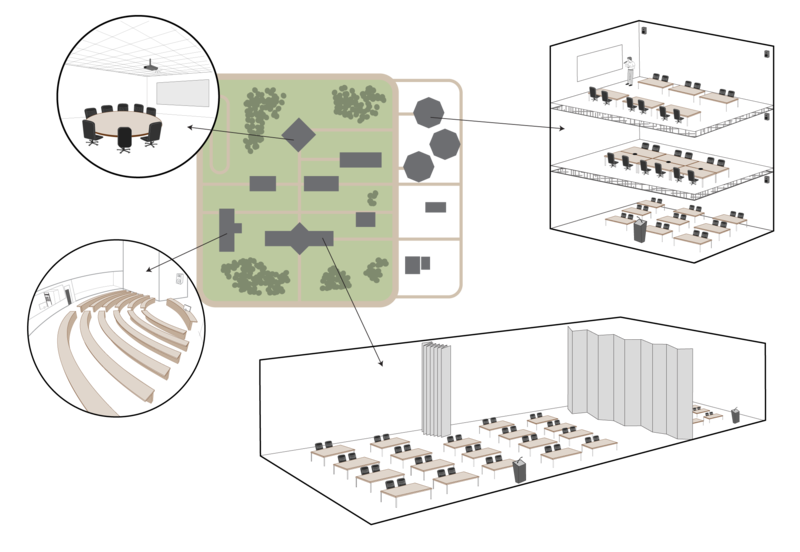 You can design a single room or create multiple locations that match the building or campus layout. Drag the virtual devices that you want to work with into the workspace. Select individual devices to view their properties to the right or click Configure to access and change the more advanced settings. 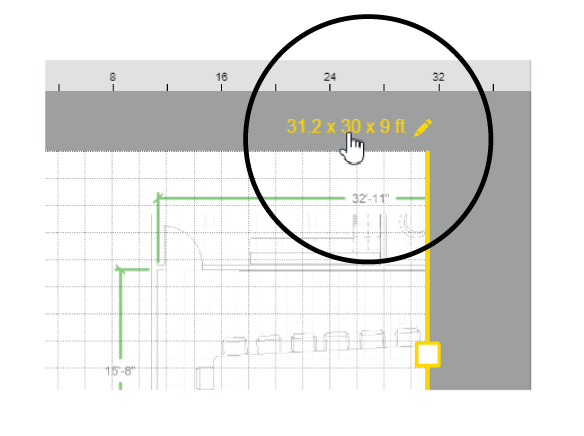 Coverage map tab - Size the location using the actual room dimensions and specifications. Use a floor plan or reference image to begin designing your location. 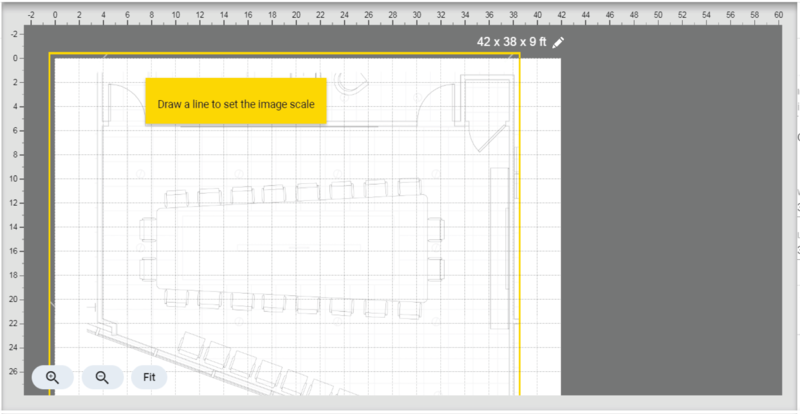 Click Add image to import your floor plan and scale it to a reference point on the drawing. 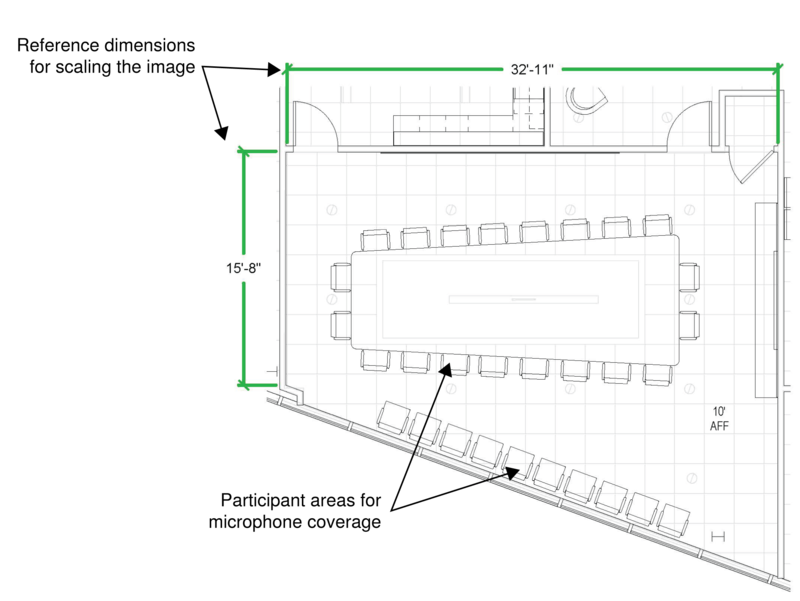 Use the image to focus the audio coverage on the expected participant areas and design with greater accuracy using real room dimensions. Add devices and position the channels around participant areas. Multiple devices can be set up in the same location, enabling excellent audio coverage for larger and more complex spaces. Click Add channel to cover the space with lobes. Use Designer to adjust the equalizer settings, manage the signal routing, and set device properties. Select the device and click Configure. Click Add channel to add channels for the microphone. Use Properties to make selections for the channel settings. Use the various features to make selections for the signal processing settings. Click Signal flow to access the Dante signal flow between the devices. Click Overview to access the Live mode button. Click Live mode to be able to push your design to the discovered devices. Ensure that you are selecting the correct device by hovering over the device and clicking Identify. Associate your discovered devices with your virtual devices by dragging the discovered devices to the virtual ones. Click Synchronize > Push to devices to push your settings to the discovered devices. Important: Push to devices overwrites all settings on your devices. If you want to save a back-up of the settings on your devices before overwriting them, create a new location, click Live mode, and Pull from devices first. When synchronization is complete, you can make changes directly to your discovered devices and fine-tune each channel by listening to the sound check and making adjustments in real-time from within Designer. Download the application and learn more at www.shure.com/designer. New versions of this software are periodically released to include new features and performance improvements. This documentation supports the latest version of the software. For more information on individual releases, see the release notes on www.shure.com. Shure System Support provides regional support teams with in-depth knowledge of Shure devices, digital audio networking, and best practices for your installation. If you encounter any issues during installation or setup of the software, contact Shure System Support for assistance. In the Americas region, you can call 847-600-8541 or visit www.shure.com to find your local support contact. Three ports, dynamically allocated at install using available ports in the range of 10000-65535. Make sure your operating system is up-to-date before software installation. The following settings are automatically made during software installation. Protect against data loss by backing up the MongoDB database (installed with Designer) that stores your Shure software information. Backups are also useful when migrating to a new server. Backups store all projects, locations, and device settings that your team makes in the software. For backup restoration, only those backup files (.bak) that match the current operating software version are supported. Use the machine installed with the software to create the MongoDB backup. Identify a location to archive the database backup. You use this path in the command line. Begin to open a command prompt by opening the Start menu and start typing “command”. Do not press Enter. Right-click the command prompt item and select Run as administrator. --port [number chosen at install] --gzip --archive="[path and file name of backup]"
Press Enter. The file is archived at the path specified in the prompt. On the machine installed with the software, open a command prompt by opening the Start menu and start typing “command”. Do not press Enter. --port [dynamically allocated at install] --drop --gzip --archive="[path and file name of backup]"
--port 10000 --drop --gzip --archive="c:\Shure.bak"
Designer 3.1 is not compatible with firmware versions prior to those listed. Exported projects are not backward compatible from Designer 3.1 to Designer 3.0. Access My Account by clicking the area in the upper left near your name. Use the drop-down menu to select your preferred language. Click My projects in the menu on the left. Type a name for your project and a description. 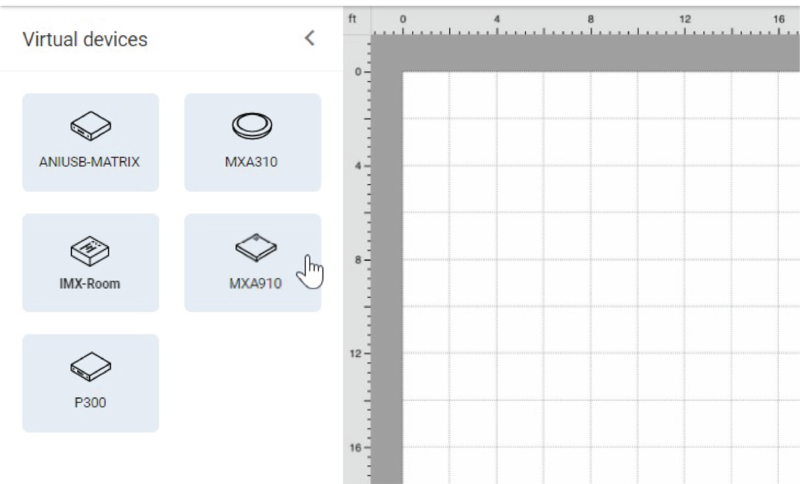 Designer uses locations so you can create multiple designs within each project. You can create a location in your project for each room and space you are designing. You can arrange and nest locations to match the project infrastructure (buildings and floors) or your own work flow (room types or templates). Select Locations if not already selected. Type the name for your location and a description. Designer creates a location with that name in your project list and opens a design window for that location. If you are going to create multiple locations and prefer to group them into folders, you can create a folder first. Type the name of your folder and a description. Designer creates a folder with that name and adds it to your project list. Double-click the folder to open it and follow the previous steps to create a location. Export your Designer project to share and collaborate with other system designers, or to save a backup of your work. The export includes all locations within your project, including all virtual device settings, routing, and coverage designs. Designer projects download as .dprj files and are only compatible with Shure Designer software. Select Import project and browse to the file you want to import. When you hover over a project, (More), becomes available to the right. Click the icon. Select Export. The file name is the project name in Designer . You add virtual devices to your workspace by dragging them from the left side menu onto your workspace. You can also add them on the signal flow tab using the same technique. 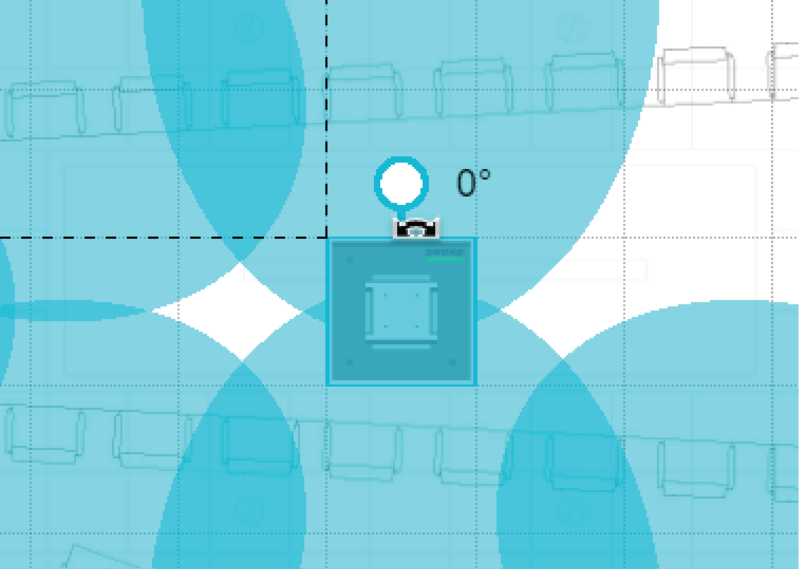 You use the Coverage map for the MXA910 Ceiling Array microphones only. The Coverage map is very helpful when you have added an image of the location and you can use it to position the microphone and its channels. You can drag one or more microphones onto the workspace, dragging to the desired position or typing the exact coordinates in Properties. See Configuring Microphone Coverage for MXA910 for more details. The Coverage map provides tools for configuring devices and interacting with the workspace in your location. The Workspace represents the total area for positioning devices and designing audio coverage. Length and Width Set the length and width of your location. Ceiling height Set the ceiling height of your location. This setting becomes the default device height when you add a device, though you can change them independently at any time. Tip: Match the unit of measure to your hardware device (for example, inches for MXA910-24IN or meters for MXA910-60CM). 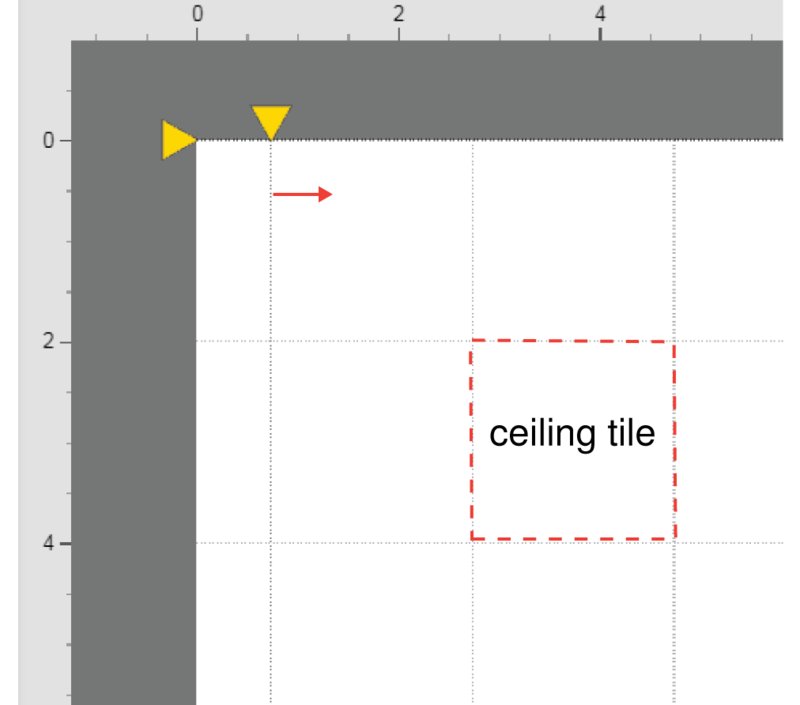 Grid: Grid starting point (X and Y) Start the grid from a different point on the workspace to align with a reference object, such as a ceiling tile in the background image. Add a background image to your location to help focus the design around the participant seating arrangements and presentation areas. Images can be scaled to represent real room dimensions for accurately positioning devices and audio coverage. Open a location and click Coverage map. Select Add image and browse to the image on your computer. Select Open to add it to your workspace. 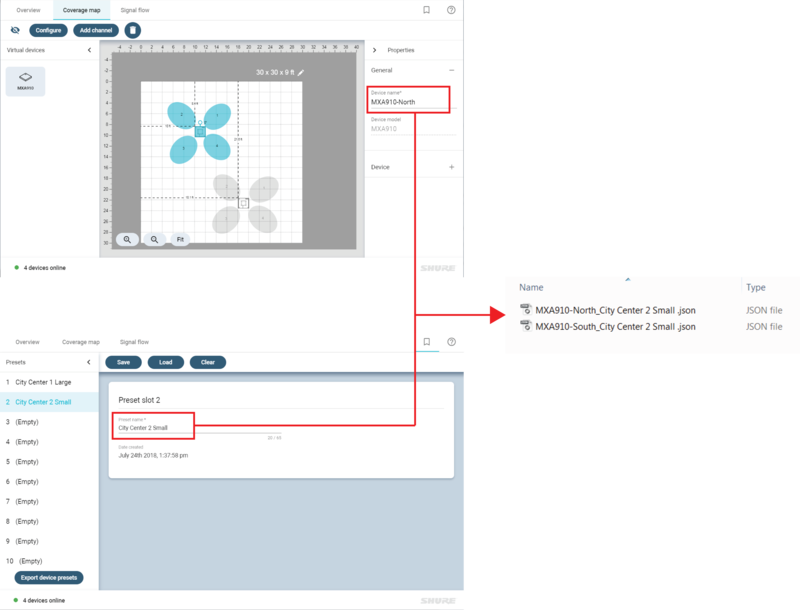 After you add an image to Designer, you can scale it based on a reference point in the drawing. If you do not know an actual measurement in your image, you can always scale the image later. Add the image to the workspace. Find an object in your drawing that has a known length. Use the cursor to draw the reference line. Enter the real length of the object into the reference size window and select Apply. Resize the workspace to fit the newly scaled image. You can redraw to scale at any time from Edit image > Draw to scale. Use the grid in Designer to move objects to an exact point in the workspace. 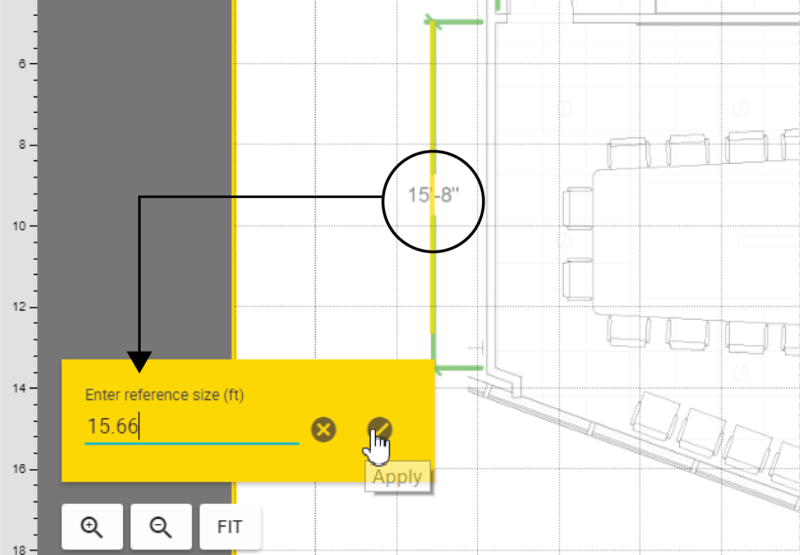 When Snap to grid is selected, the device reference corner aligns automatically to the closest grid corner. Show grid assists with aligning objects. 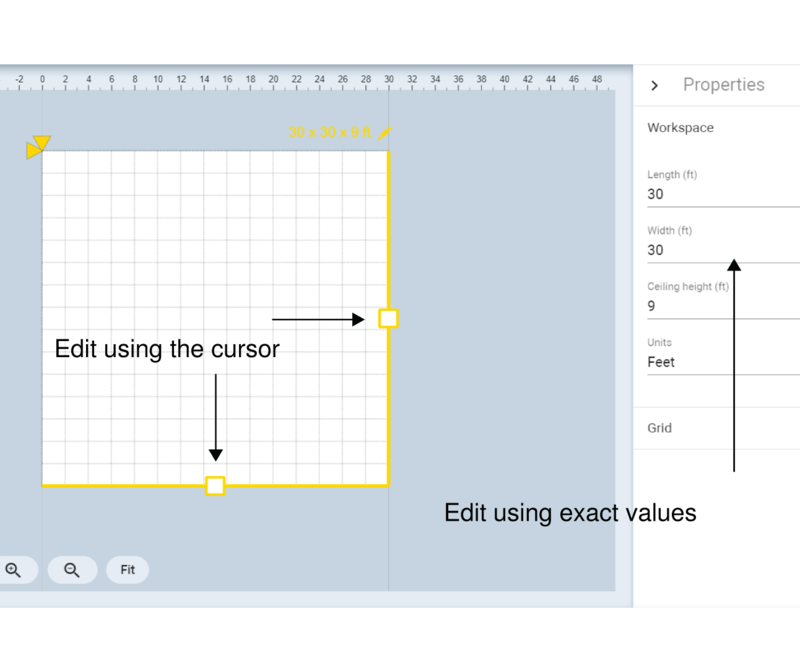 Snap to grid ensure that objects align precisely on the workspace. Shift + Grabbing the rotation handle restricts rotation to 45 degree increments. Align the grid with a reference point in your image, such as a ceiling tile or door frame, by adjusting the grid offset. Enter edit mode by selecting the dimensions above the workspace. Grab the grid offset tool and move it to the reference line. Make changes to objects in the Designer coverage page. Enter edit mode by clicking Edit image above the workspace. To exit, select anywhere outside of the image. Changing the opacity Adjust the transparency of the background image to provide more or less visibility in relation to the workspace and devices. A lower opacity value results in a more transparent image, while a higher value results in a darker image that matches the original file. Resizing the image Resize the image by dragging the corner of an image or entering a value into the properties panel. The ratio is locked so that changes to one dimension proportionally affect the other. Moving the image Change the position of a device in relation to the top-left corner of the workspace. Rotating the image Rotate the device to correctly position it in the room. Click and drag the handle to rotate the image to the desired position. Tip: Hold the shift key to rotate in 45 degree increments. Adding a device Drag a device from the devices panel into the workspace. Selecting a device Click on a device in the workspace to select it and to be able to edit its properties. To exit, click anywhere outside of the device. Removing a device Select it and press Delete or . Positioning a device Drag or nudge a device into a desired position on the workspace. The device properties displays its position in relation to the workspace 0,0 point. 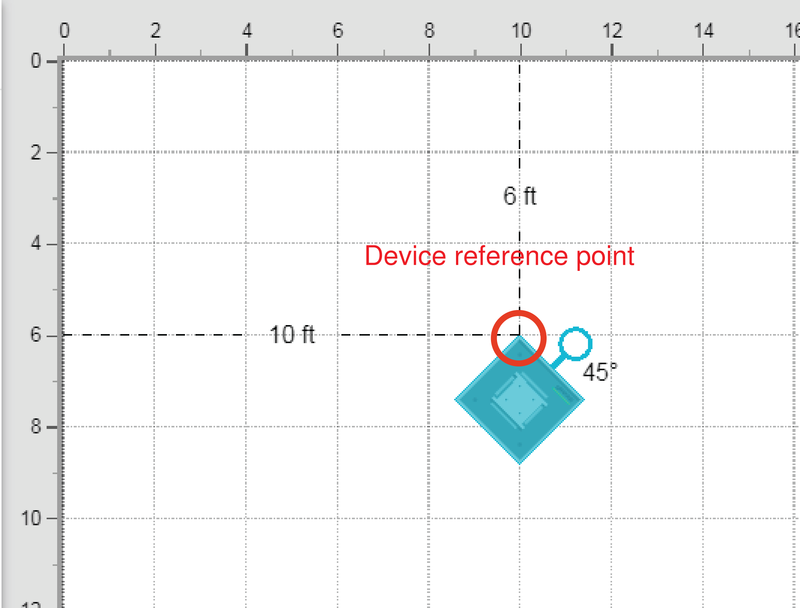 Tip: Enable Snap to grid to align the device reference point to the grid. This point is used to measure coordinates. Rotating a device Click and drag the handle to rotate the device to the desired position. Select the channel to edit its properties. To exit, select anywhere outside of the channel. Removing a channel Select the channel and press Delete or . Positioning a channel Drag or nudge a channel into a desired position. The channel properties displays its position in relation to the device and the workspace 0,0 point. Resizing a channel The channel size is a combination of selectable width setting and automatically calculated properties based on layout specifications. Layout specifications: the channel changes shape due to a combination of talker height, device height, and distance from the microphone. Designer lets system planners work off-line and off-site by using virtual devices. 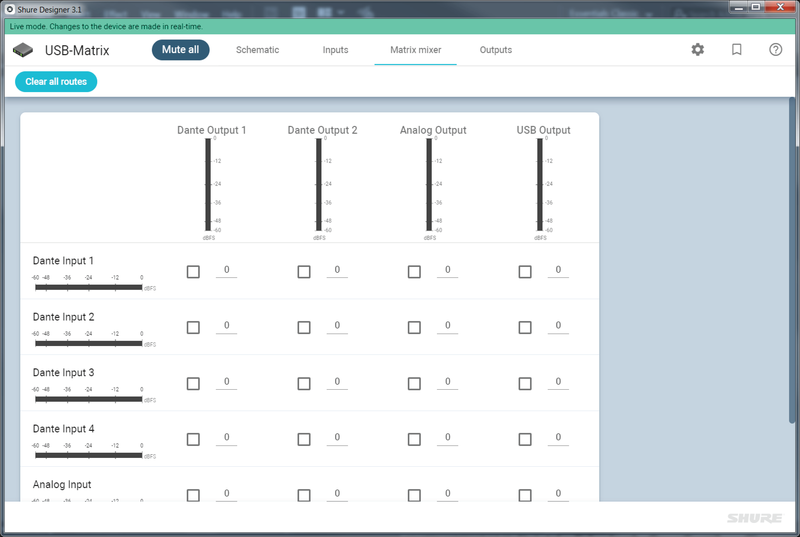 Virtual devices allow you to prepare microphone coverage, set device properties, adjust equalizer settings, and configure Dante audio routing, all without a connection to the hardware. After you complete your room or project, finish the job on-site by pushing your design to the discovered devices. You can then use Designer to fine-tune the properties on those devices in real-time. 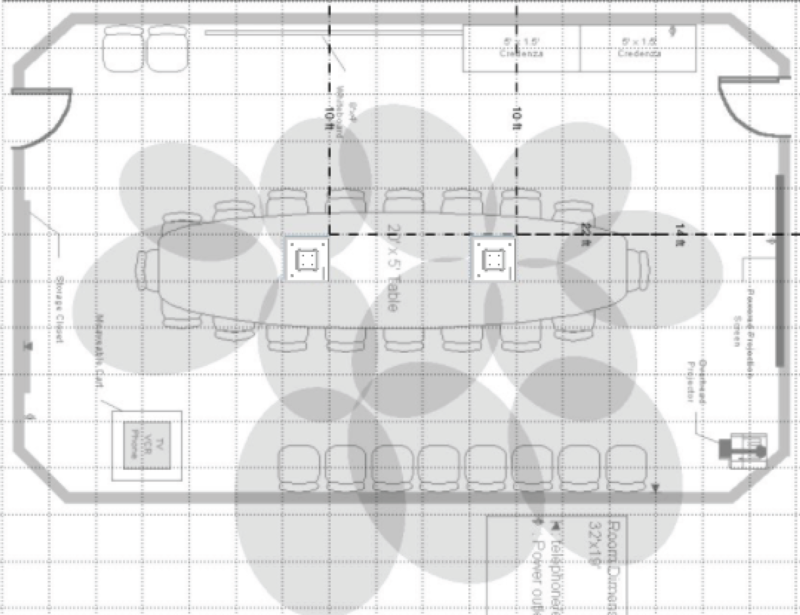 In rooms with flexible furniture arrangements or multiple array microphones, use the microphone configuration tool in Designer to ensure that the coverage is adequate for all seating scenarios. The lobes should be pointed towards the front of each talker. Carefully consider placement in rooms where talkers may face a screen during a video conference. Avoid installing the microphone directly next to unwanted sound sources, such as air vents or noisy video projectors. Consider installing acoustic treatment to improve speech intelligibility in rooms that are too reverberant. The maximum mounting height that can be set for the ceiling array microphone in Designer is 30 feet (9.14 meters). In a typical acoustic environment1, the microphone maintains an "A" rating based on the STIPA2 (Speech Transmission Index for Public Address systems) international standard at distances up to 16 feet between the microphone and talker. In better acoustic environments, the STIPA "A" rating may extend beyond 16 feet. The pickup pattern of the ceiling array is narrower than a shotgun microphone, and therefore it can be placed farther from the source than any other microphone. While Designer shows an ideal coverage zone for each channel, keep in mind that there is no specific barrier at which the audio degrades or gates off. Lobe sensitivity data is available for each width setting in the product specifications. Like all microphones, tonality changes as the distance from the source increases. The intelligibility scale helps to predict how the microphone will sound at a given height. The coverage area of the lobes increases at farther distances. The intelligibility scale objectively compares the acoustic performance of the array microphone with a cardioid gooseneck microphone at various distances. This information is useful for predicting how the array microphone will perform at a given distance and to determine an ideal mounting height. The data in the intelligibility scale table is derived from measuring the microphones to meet an equivalent value from the Speech Transmission Index IEC-602682-16 standard. Note: These values are specific to the described room. In a well-controlled acoustic environment, the array microphone may perform with equivalent Speech Transmission Index values at even greater distances. In highly reverberant rooms, the performance is less predictable. In this example, the acoustic performance of the array microphone mounted (A) feet from the talker matches the cardioid gooseneck microphone placed at a distance of (B) feet from the talker. 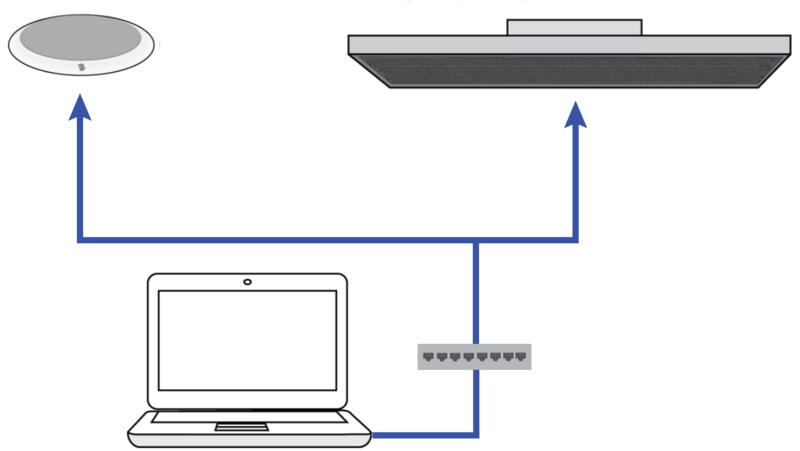 Reference these steps to get up and running with the MXA910 ceiling array microphone. For in-depth information on microphone properties and best practices, see the full MXA910 Ceiling Array User Guide. 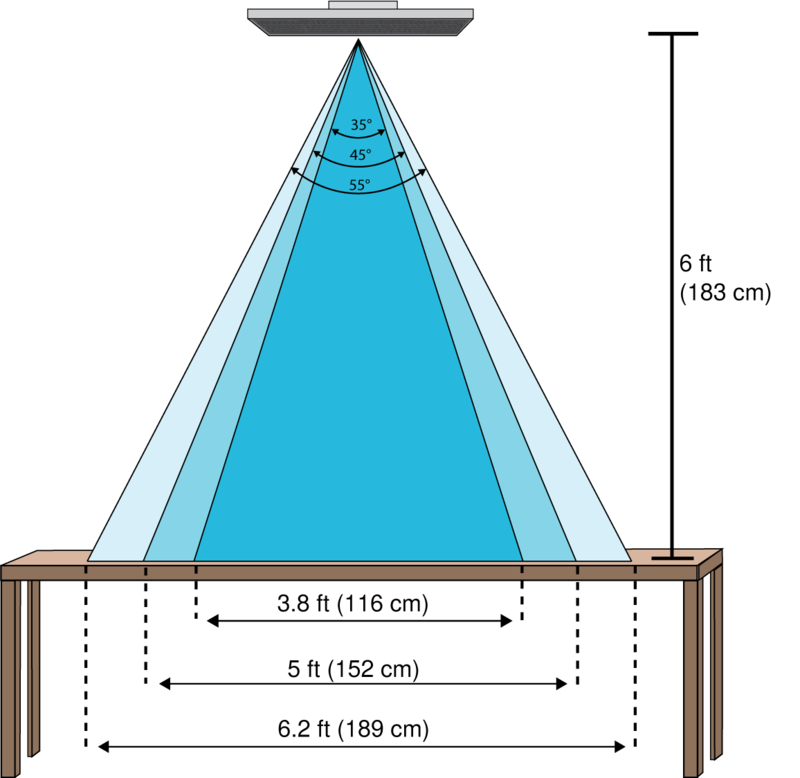 Enter a value for the device height (the distance between the floor and the microphone). 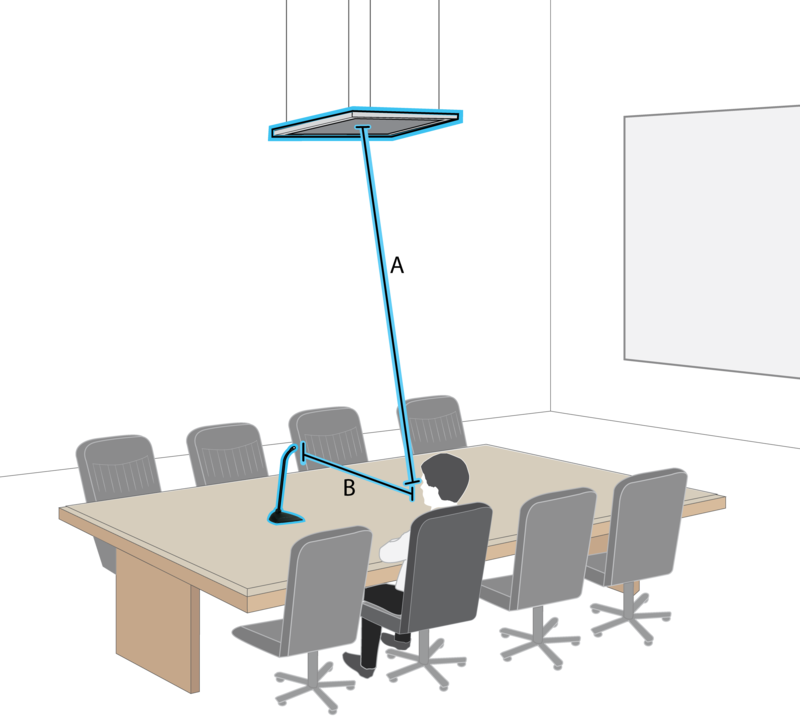 By default, the device height matches the ceiling height, though you can adjust them independently. Move and rotate the device to match your layout. Add channels by clicking Add channel above the workspace. Enter the talker height by selecting a channel and providing the value in the Properties. This ensures accurate aiming. Channels are independently selectable and can be moved anywhere within the maximum allowed coverage area. If dragged outside of this region, lobes turn red and revert back to the last acceptable position. Position the channels by dragging or nudging them into place. Distance values to the device and to the workspace 0,0 are calculated in the properties panel. Use the grid to measure the precise placement. Independent width control makes it possible for some channels to capture individual talkers (narrow), while others cover multiple talkers (wide). Choose a width setting from the pull-down menu. The width is calculated and displayed, based on the lobe location and heights entered for the device and talker. Ensure that you have the correct channel selected and the talker height specified. Click Listen. Designer listens and determines the correct position and width for the channel. A confirmation dialog displays when Designer determines the correct position and width. Each microphone has 4 channels that can be aimed independently, based on the seating arrangement. 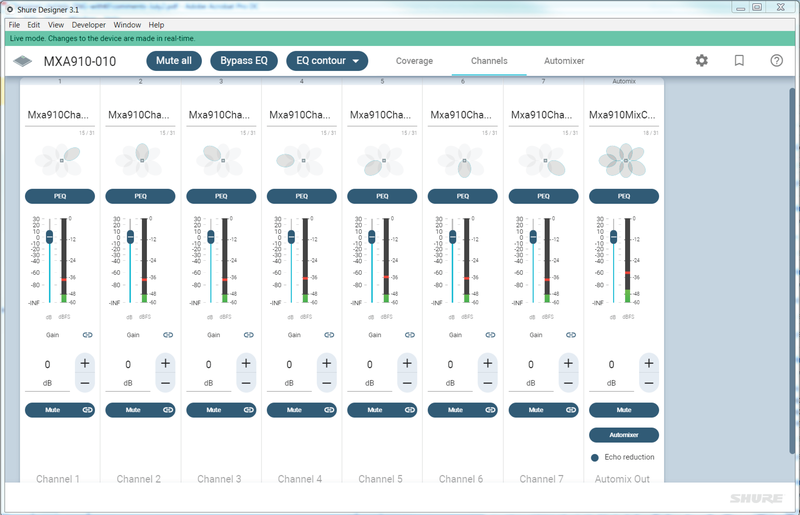 Each channel features independent polar patterns and additional channel settings, accessible through Designer . Configurable pickup areas can be rotated and modified for the number of talkers. Network connectivity, device identification, and presets allow moving, adding and removing microphones with ease. 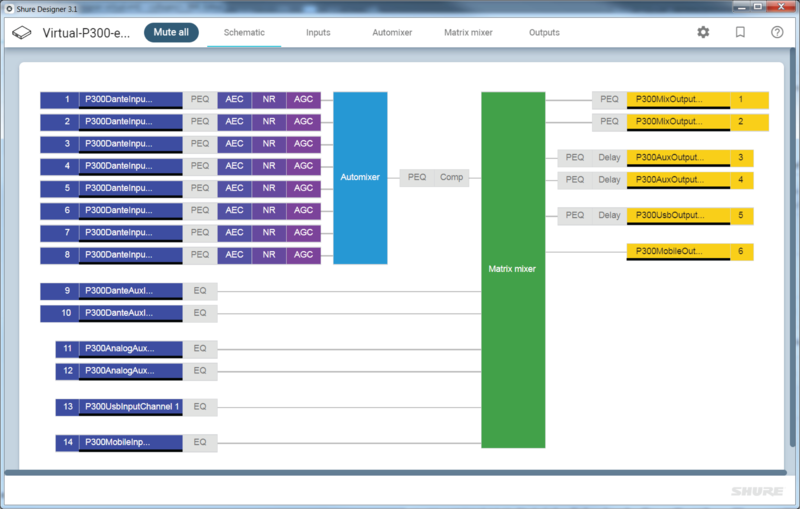 Independent channels and automixing make Dante™ signal routing simple and flexible. 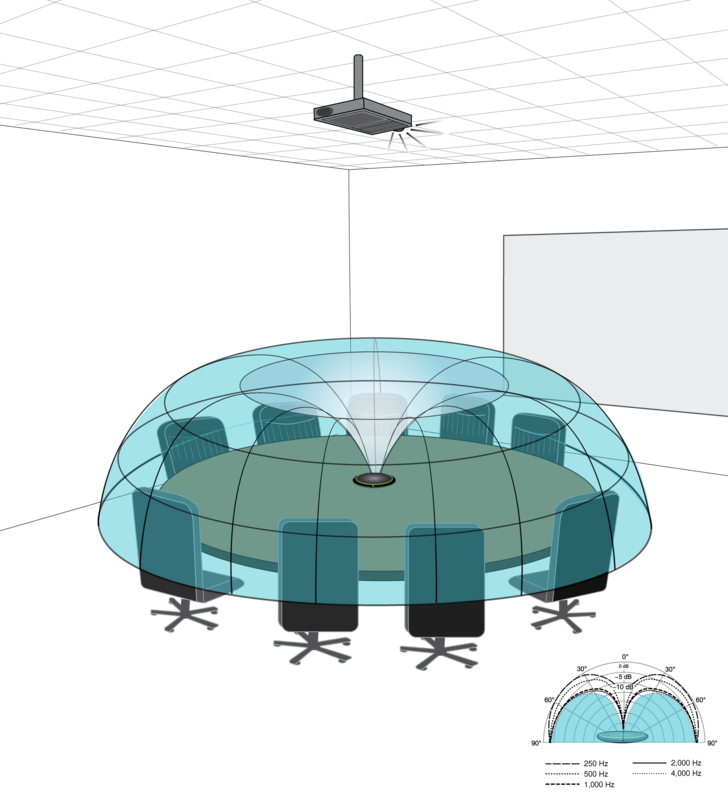 Customized presets can be saved to immediately recall different room configurations. Each channel can capture one or several talkers. 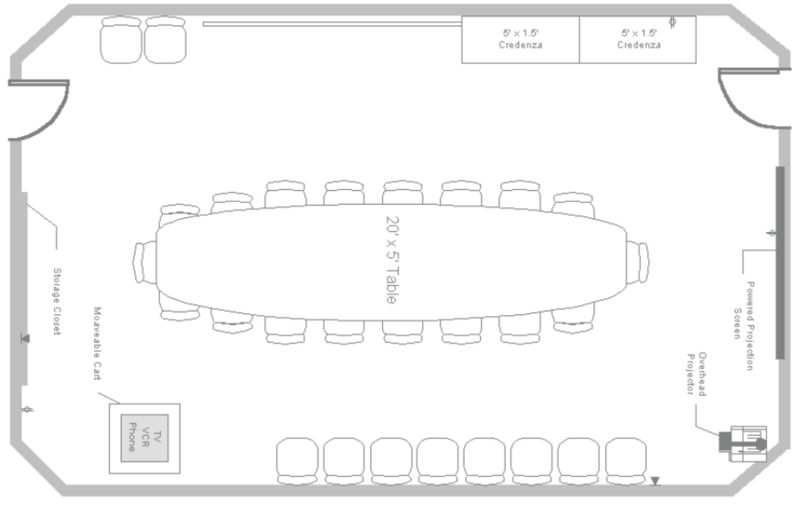 In rooms with flexible furniture arrangements, microphones can be moved to cover various seating arrangements as long as they are plugged into the same network. Note: Settings are saved on each microphone, and are retained when plugged into a different network port. Presets can be recalled and deployed through Designer , or through an external control system. With four independent channels and polar patterns, coverage can be customized to match the table shape, size, and seating arrangement. The automatic mixing feature helps reduce extraneous noise (such as typing or paper shuffling) from interfering with speech intelligibility on the far end. The toroid pattern rejects sound from directly above the microphone to reduce noise from video projectors or other sources of unwanted sound. It is the simplest way to ensure equal coverage among all talkers, while retaining the benefits of the rejection provided by a directional polar pattern. When this pattern is used, the audio is sent over a single channel. Therefore, when automatic mixing is desired, configure the microphone to use multiple directional patterns instead of the toroid pattern. Noise from a ceiling-mounted projector is rejected, while all talkers are covered. 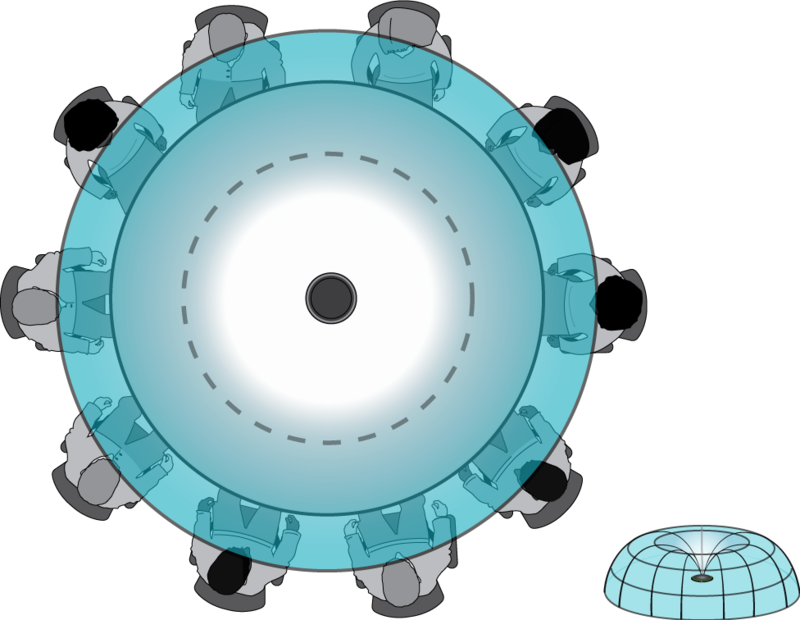 For a table with a single microphone and more than 4 talkers, the toroid pattern to ensures that all voices are heard equally. For large tables, a series of microphones captures all talkers. 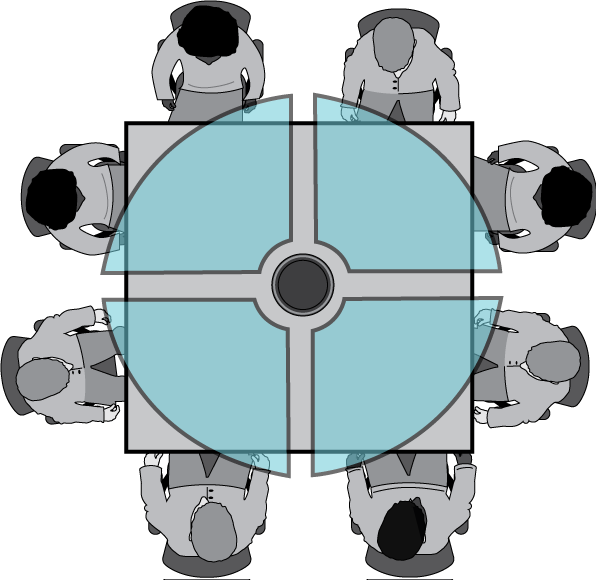 Place the microphones in the center of the table for balanced pickup and accurate aiming. For the best audio quality and clarity, use enough microphones so that each talker has their own channel. 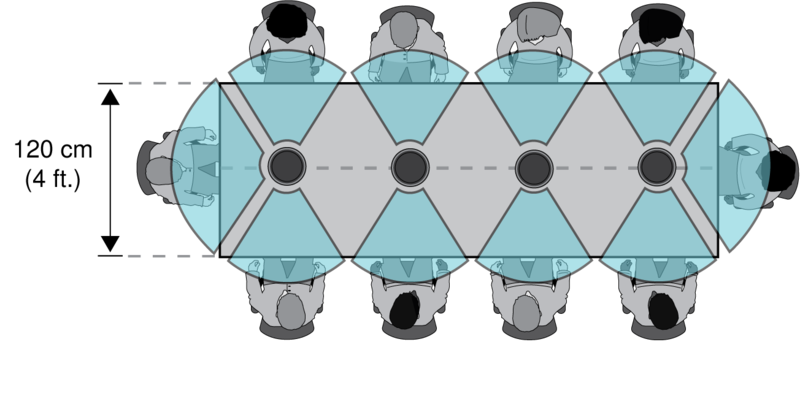 A table with 10 people is covered by 4 microphones, with an independent channel for each person. For a large table with 2 microphones, place the microphones to cover equally sized areas. 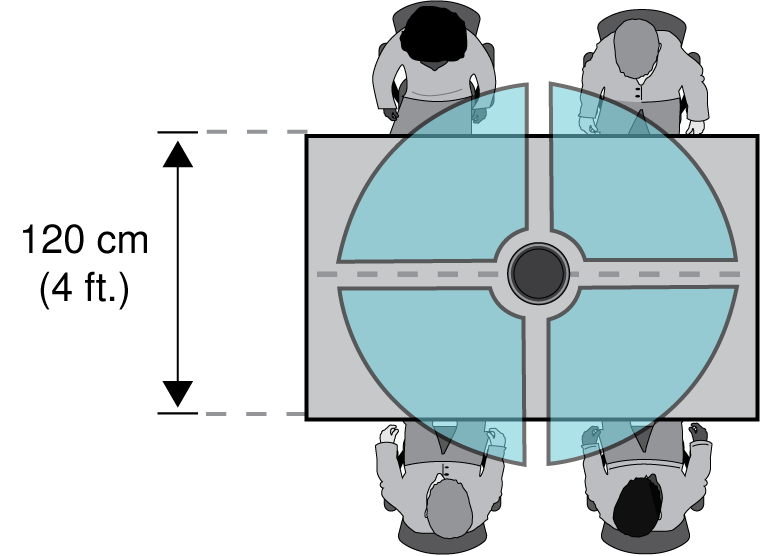 Use the Toroid or Omnidirectional setting to cover the entire table. 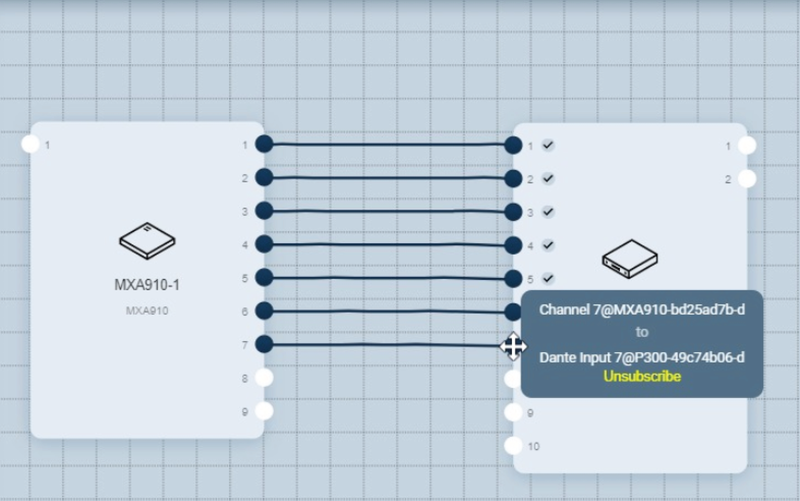 You can create Dante routes for the supported Shure devices by clicking and dragging to make connections between the devices. You can drag the devices to arrange them in the workspace. The Shure device names identify the devices. Hovering over the input or output on a device displays the Dante name, the Dante channel, and identifies it as an input or an output. Click on the input or output channel of one device and then click on the channel of the other device to create the route. After Designer creates the route, hovering over either endpoint identifies the Dante device and channel connections. Note: By default, Designer pushes the routes when pushing virtual device settings to the discovered devices, but you can opt out of creating and pushing routes if you are using a 3rd party DSP, for example. — Indicates that you have successfully created a virtual route. — Indicates that you have successfully created a valid route between discovered devices and are in Live mode. Receiver cannot locate the subscribed transmitter. Transmitter cannot locate the subscribed receiver. If simply offline, the online device will locate the offline device when it comes back online. Receiver can locate the subscribed transmitter, but there is a coding mismatch because one of the endpoints does not have encryption enabled, while the other one does. Re-key the encryption or disable encryption for both devices. Receiver can locate the subscribed transmitter, but there is a coding mismatch because the endpoints have different encryption keys. Re-key the encryption or disable encryption for both devices. Receiver can locate the subscribed transmitter, but there is a coding mismatch or other problem preventing proper operation across the route. Re-key the encryption or disable encryption for both devices. Important: Do not send the automix channel from the microphone to the P300. The P300 has its own automixer and provides better audio processing if you send the individual channels to it instead. Apply EQ from the P300 as needed. 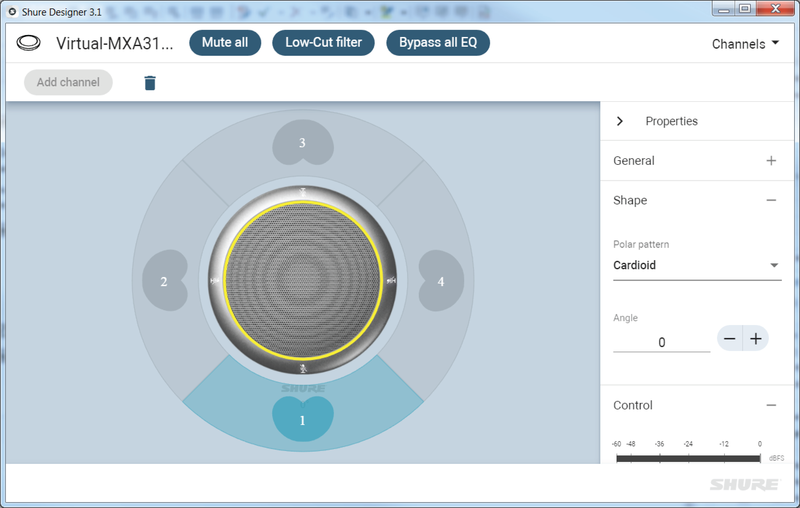 Use this EQ to adjust for the room's acoustic conditions. Note: If you have both a table array microphone (MXA310) and a ceiling array microphone (MXA910), you should use the MXA910 optimizations for microphone optimization mode and post-automix PEQ. After creating your location and designing your audio coverage, you can leave Design mode and work in Live mode to push the settings out to the discovered devices. From within your location, click on Overview to access the Live mode button. The Live mode button is a toggle that turns Live mode on and off. The button turns green and a green banner across the top identifies that you are in Live mode. To the left you see all of the discovered devices on your network that have not already been added to another one of your locations. 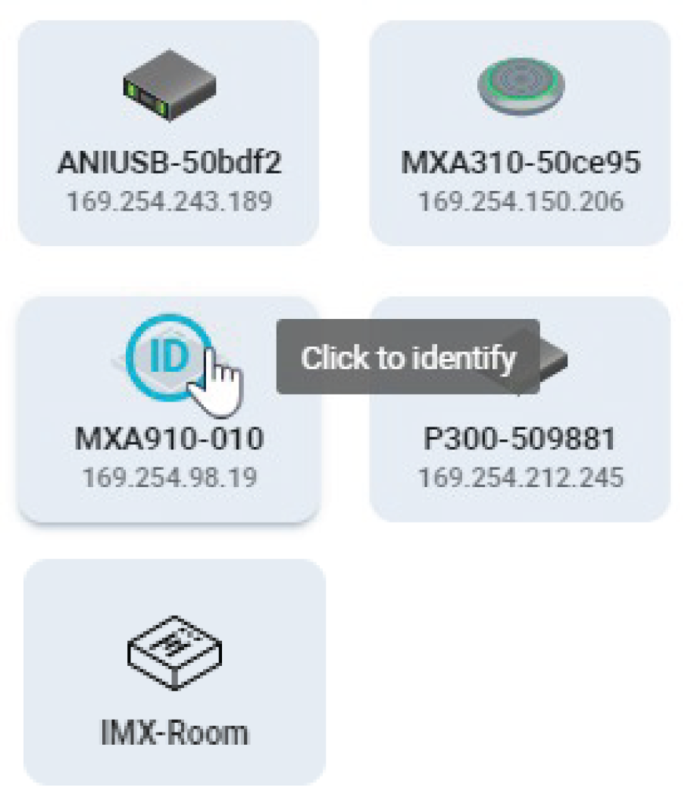 Designer automatically discovers supported Shure devices on the same subnet and you can add cross-subnet devices by navigating to Online devices where you can add them by IP address. If you have many devices, you can sort by device name, IP address, or device model. You should initially hover over a discovered device and click to identify it, ensuring that you are working with the correct one. Associate your discovered devices with your virtual devices by dragging the discovered device to the virtual one. Associating a discovered device with a virtual device does not actually push the virtual settings to the discovered devices until you click Synchronize and Push to devices. You disassociate a device by clicking X. When all of your associations have been made, click Synchronize to sync up the discovered devices with your virtual devices. You can either push your virtual settings to the discovered devices or pull any settings from those discovered devices to overwrite the settings in your design. Note: You can opt out of creating and pushing routes to discovered devices if you are using a 3rd party DSP, for example. In live mode, you are making changes directly to your discovered devices and you can fine-tune them with Designer. Note: Be aware that some of the changes you make can cause the audio to momentarily drop out. When you Synchronize and Pull to design, Designer overwrites the devices in your design with the discovered device settings. Additionally, the pull may include some reference device settings that you cannot change and that would not be included in a push, for example, MAC address. When your devices are configured and set for a given location, you might want to save a specific design as a preset on all the devices. Presets are useful, for example, for a multipurpose or combinable room where the room can have different configurations. You can have multiple preset designs ready to load when the room configuration changes. 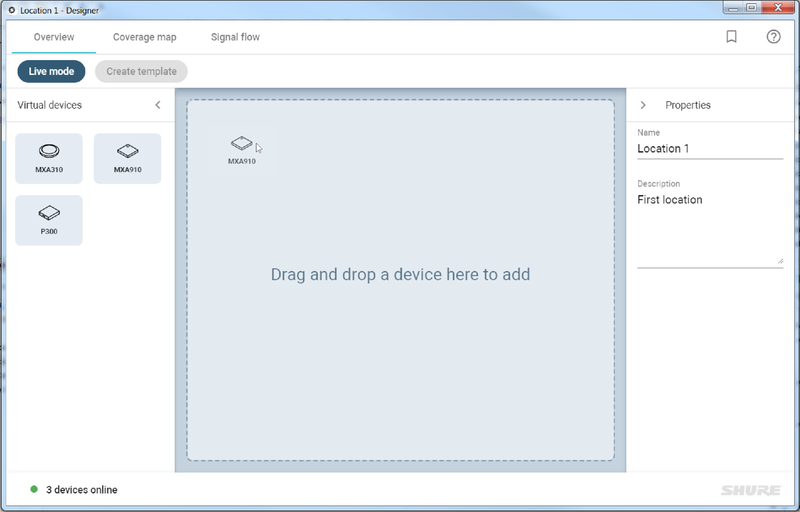 Click (Presets) in the upper right corner to open the Device presets pane. This shows you the presets for all devices in the location. Select the preset that you want to load. Routing information is not saved in presets. If you are in Live mode, this activity may cause the audio to momentarily drop out. Any changes made after loading presets results in an unsaved state. Save any new settings to a new preset slot or overwrite the old one with your new settings. You can export your preset settings so that you or someone else can use the device web application to implement your design. Designer exports the device preset settings that overwrite any existing device settings when you upload the file to the device. Click (Presets) in the upper right. Select Export device presets from the menu. By default, the exported .zip file is saved in My Documents with LocationName_Date_Time for the name, though you can browse to save the file with any name in any folder. Device preset files (.json extension) are bundled in the a .zip folder inside nested folders named according to PresetSlot - PresetSlotName. Each preset file is named according to the following: DeviceName_PresetSlotName, for example, MXA910-North_City Center 1 Large.json. The device name helps to differentiate the exported files. For this location, separate files are exported to upload to the two devices. Connect a computer to the device using a Cat 5e (or higher) cable and open the web application. Go to Presets > Import from file. Choose an empty slot and select Choose file... to browse to the device presets file on your computer. Select Import to load the file. After the import is successful, select Go to Load Presets. Select the preset you just imported and click Load. Your design file is applied to the device. For best results, perform a sound check of your settings in the room. Use headphones and check each channel to optimize the audio coverage. To view the event log, click Event log from the main menu. The event log provides a detailed account of activity within Designer. The log collects and time-stamps activity entries and retains them for the period of time that you specify in Settings, from 30 to 360 days. The Export feature creates a CSV (comma separated values) document to save and sort the log data. To export the event log for a specific device, navigate to that device in Live mode and Click (Settings) > General > Export log. This feature creates a CSV (comma separated values) document of the log data. Information An action or event has been successfully completed. Warning An action cannot be complete, but overall functionality is stable. Error A problem has occurred that could inhibit functionality. Event Indicates the event type. Description Provides details on events and errors, including IP address and location where applicable. Date Date and time of the event. Tip: Select a category heading to sort the log.